I’ve reviewed the audio version of this in the same issue of Music Street Journal and that addresses specific songs better than this particular review will. This BluRay is awesome, let’s just get that out of the way. The video and audio quality are great and the performance is incredible. 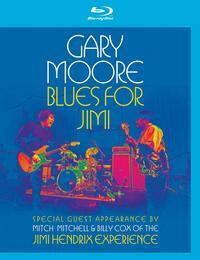 This is highly recommended to fans of Gary Moore, Jimi Hendrix and guitar rock in general. It would have been nice to have a longer show, this is less than an hour and a half, and some bonus features, but when it’s this good, it’s OK either way.